Posted on May 11, 2016 by Lea S.
If ever there was a film that you could point to and say, “This is surely everyone’s favorite short experimental animated German Dadaist film,” it would have to be artist Hans Richter’s endearing Ghosts Before Breakfast (1928). (And yes, I know it’s perfectly impossible to choose a favorite German Dadaist short.) If you roll your eyes at modern art, which admittedly describes what my own eyes do 85% of the time (don’t even, Damien Hirst), never fear. Somehow, Ghosts Before Breakfast manages to be both over-your-head artsy and charmingly accessible. What follows is a fast-paced, topsy-turvy little piece that plays like a René Magritte fever dream. The objects–ordinary clocks, coffee cups, bow ties, ladders, pistols, hoses, and of course those famous bowler hats–“revolt” through the magic of stop motion and other trick photography. The bow tie keeps gracefully untying itself, coffee cups empty and refill, and the hats fly through the air, sailing just out of reach. Men walk and crawl in rhythm, trying to sneak up on their hats. The men’s movements are deliberately mechanical compared to the more spontaneous objects. Some of the images are only loosely tied to the theme of revolt, presumably because This Is Dadaism, y’all, and don’t you forget it. There’s a shot of a group of raised hands, an animated branch sprouting leaves, and people walking single file to vanish behind a pole. Is Richter’s surreal world also a statement about revolt? Is he is showing reality itself defiantly unraveling? If anything, Richter knew how to hold our interest. There are dashes of tense imagery showing pistols forming patterns, a bulls-eye overlaid over a girl’s legs, a pistol cocking, etc. The rings in a bulls-eye slide apart. A still image of a human body breaks into pieces and falls; the film then segues into two men socking each other and shots of a laughing mouth of frankly nasty teeth. These might function partly to keep reminding us that This Is Dada, y’all, a serious piece of serious artiness because look, violence. But I’m sorry, Richter. When all is said and done, those bowler hats are just too darn adorable. 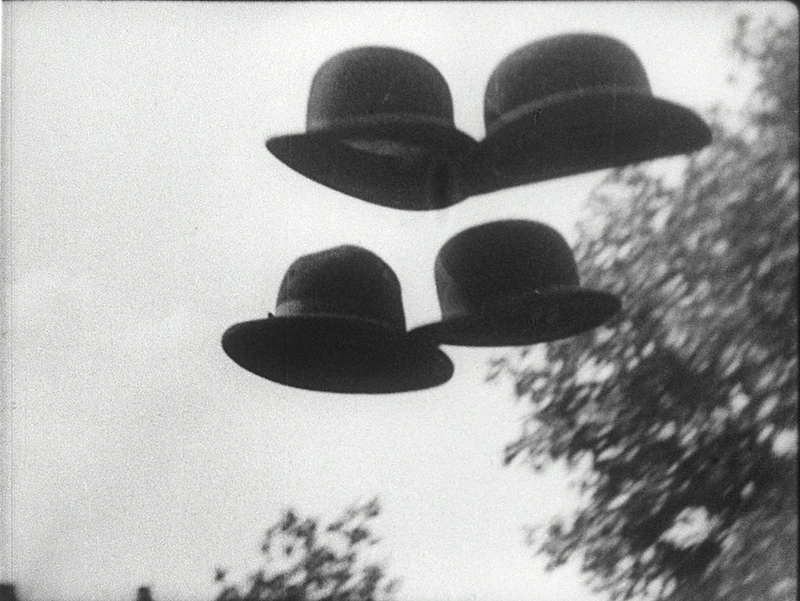 The iconic shots of those hats are arguably what make the film a classic. They not only tie the film together–giving coherence to certain sequences and at least serving as a framework for others–but they stick in your mind, like the razor slicing a calf’s eye or Harold dangling from a clock. It was achieved by attaching the hats to black strings, dangling the strings on a pole, and standing on a garage to let the hats swoop past the camera. You can see the pole, or its shadow, a couple times, but surprisingly the strings are invisible (at least, in the prints I’ve seen!). Back in the 1920s audiences would’ve recognized the satire, due to symbolism that’s no longer common knowledge. The shots of the clock references the common German expression “five minutes to twelve,” meaning “danger’s coming and time’s running out.” Hats were an essential part of everyday life, and the idea of hats flying off their owners’ heads symbolized looming threats to society. The moving objects themselves seemed anti-authoritarian, almost anarchist. Back then, the Nazis quickly felt that Ghosts Before Breakfast‘s warnings were referencing the rise of National Socialism. 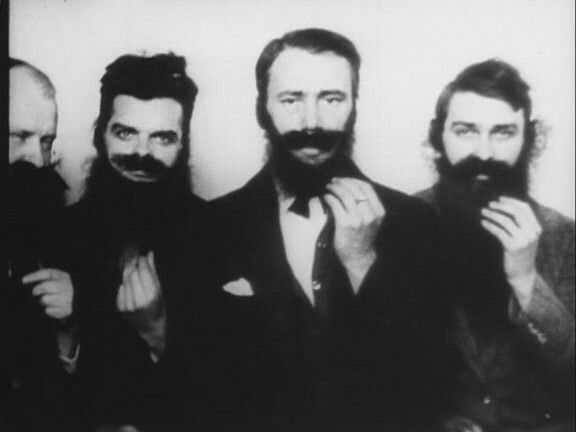 As they disliked Dadaism to begin with, it didn’t take long for Richter’s film to start “disappearing.” Happily, the English version escaped long enough to end up becoming one of our avant-garde essentials–and one that goes beyond merely baffling us to amuse us, too. Ghosts Before Breakfast may have functioned as a political film initially, but like many great works its artistic technique has proved to have a timeless appeal. Richter, I know you were committed to your Dadaism and your anarchy and all that jazz, but believe me when I say this: those bowler hats are simply way too much fun. The original score by Paul Hindemith was chucked by the Nazis, so there are multiple new scores floating around to choose from. My absolute favorite is a a vintage track that’s a delightful big band/polka mixture that goes with the film perfectly, and I mean perfectly. My apologies to Hindemith, but I don’t want to watch Ghosts Before Breakfast with anything else. This entry was posted in Thoughts on Films and tagged avant-garde, Dada, experimental films, German films, Ghosts Before Breakfast, Hans Richter by Lea S.. Bookmark the permalink. A most interesting film—I had not heard of this one. I love these plotless avant-garde experimental things. 🙂 (Man with the Movie Camera is one of my all-time favorite films!) With this one, though, I don’t quite see how the separate elements hang together to form a whole very much—but I’m betting that’s probably a deficiency on my part rather than the film’s. I need to watch it again. It certainly does keep your attention, and the derbies do make a charming unifying device. It would have certainly been interesting to hear what the Hindemith score sounded like. I wonder if there’s not a manuscript of it floating around somewhere? I like the one in the version you posted though; it seems to fit the spirit of the goings-on very well. Knowing avant-garde, it wouldn’t surprise me if the original score was mostly a bunch of noise.n:-D Man With a Movie Camera is a classic! Another one that’s interesting is The Seashell and the Clergyman, very dreamlike, it’s like you’re getting a visual look at someone’s subconscious. Wow, I had forgotten about that one until you mentioned it. I must see it! I ran across a mention of it when I was reading about Germaine Dulac a few months ago and intended to find and watch it, but never got around to it. Have you seen La Souriante Madame Beudet? That is one of my very favorites. What a masterpiece!